Original Hollywood sewing pattern, circa late 1930's to early 1940's. 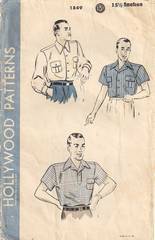 Although no movie star is featured on this particular pattern, the gent on the upper left looks very much like George Brent. This pattern is for men's shirts with two styles of fronts. Slip over with lap closing and open fronts with buttons and buttonholes. Convertible neck and patch pockets. Gathers below back shoulder yoke. Short sleeves or long sleeves gathered to buttoned bands. Men's Size 15-1/2, Sleeve Length 34. The pattern pieces are unused and still in original factory folds. The envelope is solid; some wear and tiny cracks at edges. Pattern pieces and instruction sheet are tanned with age.